Cop movies, revenge films, fisticuffs, martial arts and war movies. He’s the “chosen one.” There’s no Obi-Wan to be found, but who needs him, when you’ve got Stallone? Rambo: First Blood Part II, is the prototype for all special forces-type commando movies. 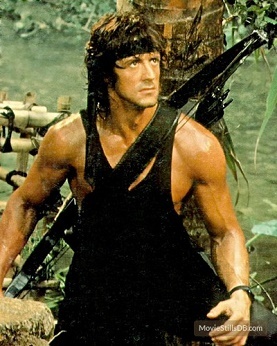 After the subtle understatement of First Blood, there is moon-bat action aplenty in the sequel, with Rambo sweating his way through two head bands, and baddies who wear the wrong color camo in the jungle. John J. Rambo (JJR) is working on a chain gang, when he’s approached by Colonel Trautman for a covert recon mission to rescue POWs who are still being held captive in ‘Nam. And naturally, it’s a suicide mission. And of course, there’s a timeline attached to it, part of what management/business types would call a critical path — where he’s supposed to be when, what weapons he’ll use, what he’ll encounter there, etc. It’s a cheap and cheerful way for screenwriters to ratchet up the tension. In Rambo: First Blood Part II, he’s got 36 hours, and to prove how awesome a specimen JJR is, he doesn’t eat or take a dump for the whole duration. Still, you can’t have an 80s action movie without a spectacular arming / weaponry montage, and while the mind may be the best weapon, a machine gun is really what’s top-drawer when it comes to blasting khaki-clad extras off rickety wooden boats in muddy rivers. And because it was the 80s, Russians, not just the Viet Cong, made for fantastic bad guys (they still do, decades hence). They make all kinds of macho patter when they could’ve easily cut Rambo’s throat rather than subjecting him to a mud bath of leeches. 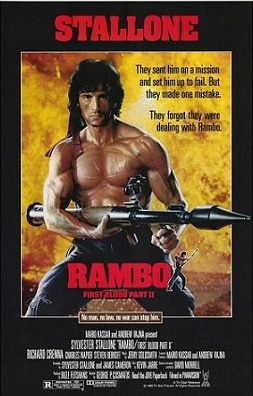 Re-watching Rambo: First Blood Part II, one is staggered by the hack chutzpah of Bruno Mattei, whose cornball 1987 hit, Strike Commando, is a note-for-note walk-through of this movie, complete with a scene where Mike Ransom has to make a radio address under duress and cradles a dying boy, much like JJR does Co-Bao (the Razzie-nominated Julia Nickson). Luckily, George P. Cosmatos and not Mattei, is behind the camera for Rambo, he of the exemplary Tombstone, and the enjoyably asinine Leviathan. And under his tight direction, we get something pretty glorious. And while we love Reb Brown, he is clearly no match for the steely mullet of prime-beef Stallone. In exchange for his freedom (Snake is a convicted bank robber), he’s compelled into what on the surface is a suicide mission: drop onto island via glider, rescue the president, and do all of this before subcutaneously injected capsules on time release blow his arteries to bits. 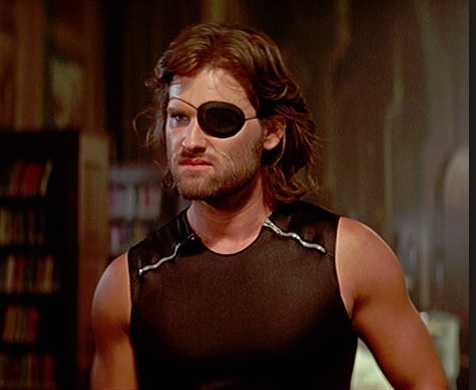 The injections are to prevent the resourceful Snake from simply escaping (the open air island prison may be escape-proof, but as we saw with Alcatraz, it’s possible someone as substantial as Plissken could make a go of it). To assist him on the mission: a yellow cabbie played by Ernest Borgnine, of all people. He shepherds Snake to get intel from Brain (Harry Dean Stanton). But it gets better. Along for the ride, the incomparable Isaac Hayes as the Duke of New York, a kind of capo di tutti cappi of the roving prison gangs. All roads to the president must lead through him. The New York City streets have seldom looked this mean (in truth, they’re actually St. Louis). The one shot that is The Big Apple is perhaps the most ironic and iconic: the tracking shot of Lady Liberty, holding her torch above this newly-created urban penitentiary. The dystopian cityscape is a wonder. John Carpenter’s direction is simply stupendous. The man really outdid himself here. As gorgeous and compelling as it was upon first release, you owe yourself to see this thriller. 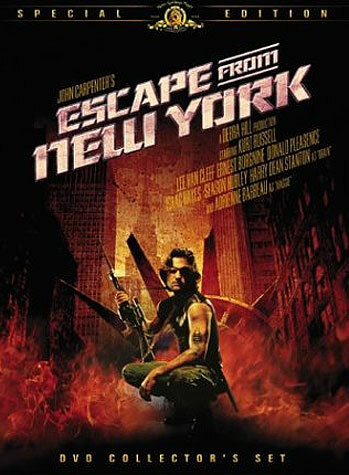 There’s talk that Escape from New York is being set up for a reboot: Fox has obtained the rights, though it’s too early to know anything further.